A chimney liner is a critical element of the chimney. The chimney liner will guide the combustion that is created in the chimney and guide it away from the chimney. It is a major element of the chimney and provides safety for your home. Reduces Fire. It reduces fire because a chimney liner forms a barrier between the fire and the chimney. This barrier, the chimney liner will reduces fires that can occur in an overheated and extremely hot chimney. Prevents Harmful Toxic Gases. The chimney liner will take harmful toxic gases such as carbon monoxide and guide it out of your home. If the chimney liner is damaged or there is no chimney liner in your chimney, then the toxic gases can enter your home; this can be deadly and dangerous. Energy Efficient. The chimney liner provides energy efficiency. The chimney liner will reduce any heat loss. Provides Safety. The chimney liner provides safety to a home. The chimney liner protects the joints and the structure from overheating, which causes house fires. A chimney liner is a critical element of the chimney. The chimney liner provides safety, energy efficiency and so much more. 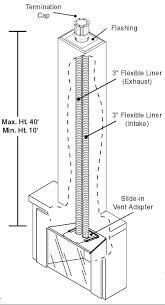 If you have a home that was built before the 1940’s, then more than likely your chimney doesn’t have a chimney liner. It is important that all homes have a chimney liner for their chimney. The chimney liner should be maintained and inspected often to provide safety and security for your home. Safeside Chimney are the chimney liner specialists. Call Safeside Chimney to have your chimney liner inspected and maintained. For more information on Conneticut’s chimney specialists, click here!